Aug 21, 2017 at 10:06 AM | 59 Views | Last edit Aug 24, 2017 at 11:52 AM 5 rev. My Client's requirement is to make the "Annuity Installment" as the "Required Field" under the Conditions tab in IT0045. When I Am trying to make it as Required Field through module pool MP004500, corresponding to P0045-ANRTE field no radio buttons are appearing as shown below where as for other fields like P0045-TILBT radio buttons are appearing and able to make it as Required Filed. 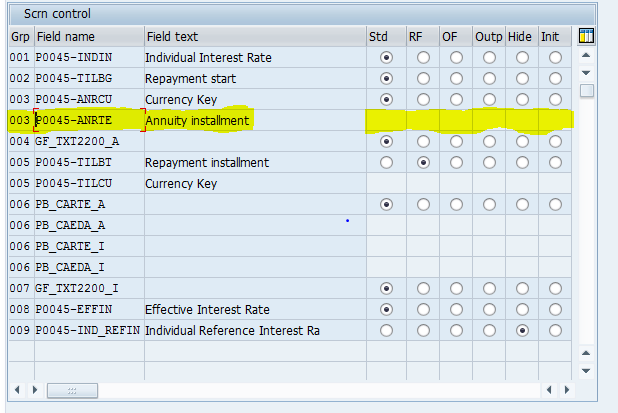 Experts could you please help me to make the "Annuity Installment" field as " Required Field" and explain what are the reasons for not appearing the radio buttons corresponding to P0045-ANRTE field?